← LOG#110. Basic Cosmology (V). The topic today: problems in the Standard Cosmological Model (LCDM), inflation and scalar fields! Despite the success of the Standard Cosmological model (or LCDM), today it is widely accepted that it is not complete, even if its main features and observables are known, there are some questions we can not understand in that framework. Note that for a MD Universe and to for a RD Universe. 1) k>0: the Universe recollapse withim few . 2) k<0: the Universe reaches 3K at . 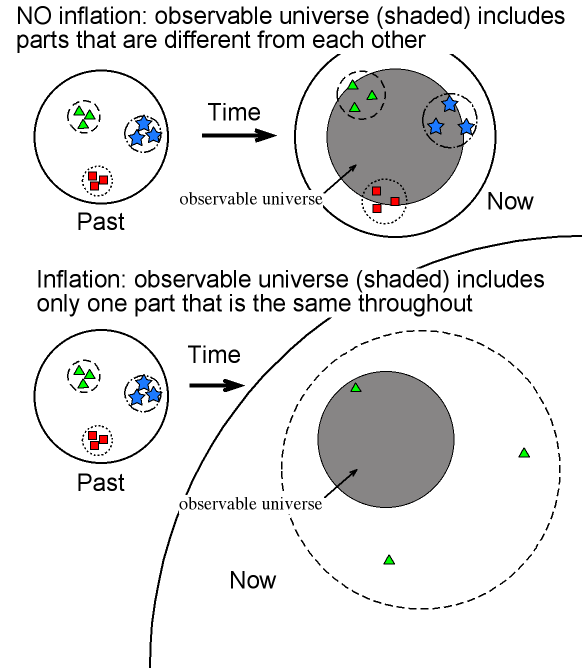 Therefore, the natural time scale for cosmology is the Planck time (at least in the very early Universe and before) . The current age of the Universe is about . or so( even the mismatch can be 122 or 123 orders of magnitude!!!!). This problem is far beyond our current knowledge of QFT. It (likely) requires new physics or to rethink QFT and/or the observed value of the vacuum energy density. It is a hint that our understanding of the Universe is not complete. One of the most “simple” and elegant solutions to the flatness problem and the horizon problem is the inflationary theory. What is inflation? Let me explain it here better. If the (early) Universe experienced an stage of “very fast” expansion, we can solve the horizon problem! However, there is a problem (you can call Houston if you want to…). If we do want a quick expansion in the early Universe, we need “negative pressure” to realize that scenario. 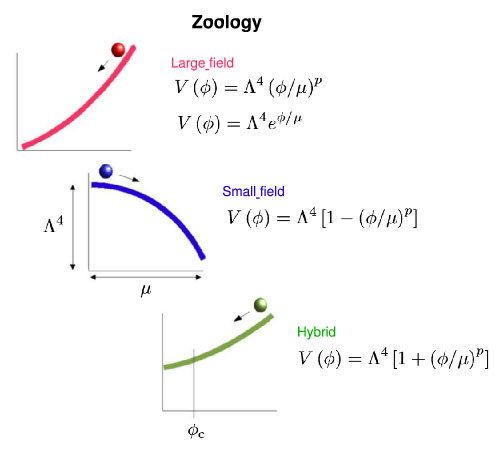 Negative pressure can be obtained in an scalar field theory (there are some alternatives with a repulsive vector field and/or higher order tensors like a 3-form antisymmetric field, but the most simple solution is given by scalar fields). 1st. If , we can never have a communication between those particles. 2nd. If , then we can never communicate NOW using those two particles. It shows that it is possible to have . A particle with ca not communicate today BUT they could be in causal contact early on. We only need that . That is, get contributions mostly from early epochs. Indeed, both in RD (Radiation Dominated) and MD(Matter Dominated) Universes, increase with time, so the latter epoch contributions dominate over cosmological time scales. Then, a solution for the horizon problem is that in the early Universe, in this “inflationary” (very fast) phase, for at least a brief amount of time (how much is not clear) the comoving Hubble radius DECREASED. i.e., we get an (positively) accelerating expansion or “inflation”. and thus can be guessed from the so-called “e-folds”, or exponential factors, in a very simple way: note that !!!!!!!!! Therefore, more than 64 “e-folds” (or the 64th power of the number “e”) provide the necessary 10-fold we were searching for. Remark: The comoving horizon is very similar to an effective time parameter! 1st. 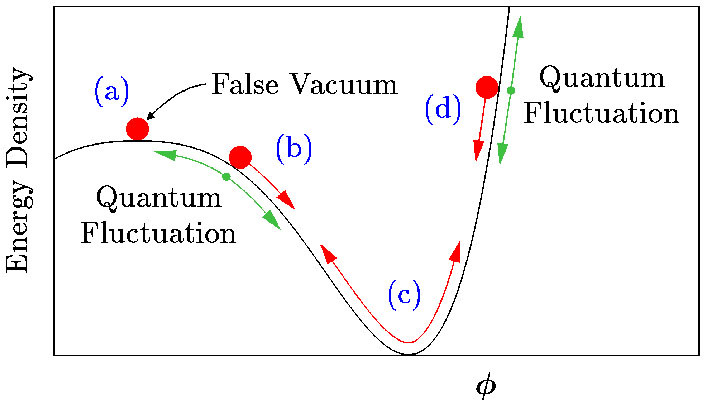 A scalar field with negative pressure is trapped into a “false vacuum”. 2nd. 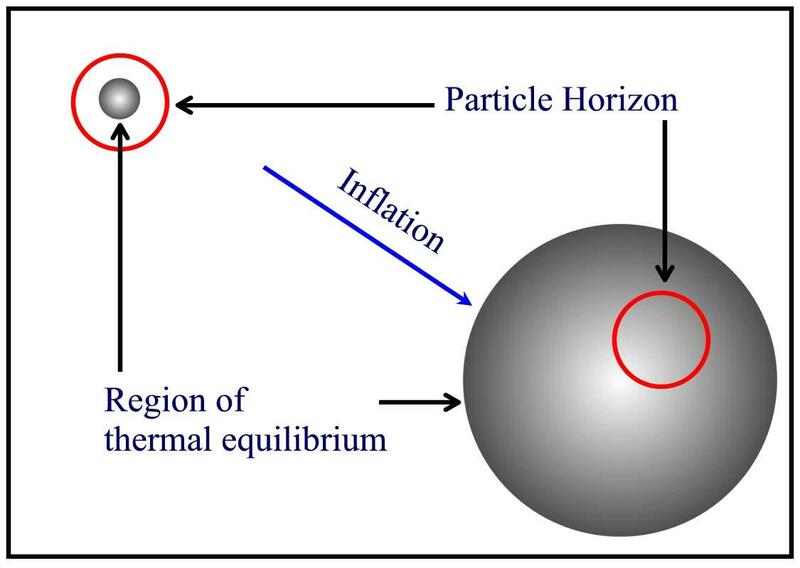 A scalar field “slow-rolling” toward its true vacuum provides a simple model for inflation. 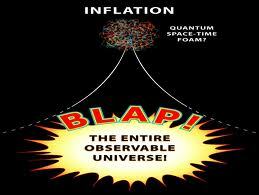 Remark: for inflation and for RD Universes imply that is a definition of inflationary phase! 1) Big Crunch (or recollapse of the Universe). The Universe recollapses until the initial singularity after some time, if it is massive enough. Current observations don’t favour this case. 2) Big Freeze (or thermal death of the Universe). The Universe expands forever cooling itself until it reaches a temperature close to the absolute zero. It was believed that it was the only possible option with the given curvature until the discovery of dark energy in 1998. 3) Big Rip (or Little Rip, depending on the nature of the scalar field and the concrete model). Vacuum energy expands the Universe with an increasing rate until it “rips” even fundamental particles/atoms/matter and galaxies apart from eath other. It is a new possibility due to the existence of scalar fields and/or dark energy, a mysterious energy that makes the Universe expanss with an increasing rate overseding the gravitational pull of galaxies and clusters! 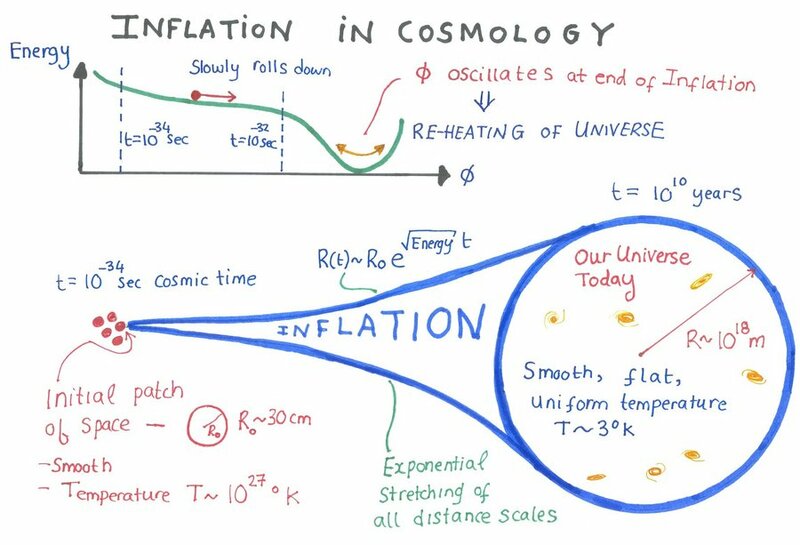 See you in my final basic cosmological post!